Any Device. Any Time. Any Where. Highly Optimized and Compliant: FDA 21 CFR part 11 and HIPAA compliant system, NEForm allows our experienced team to build complex clinical studies in weeks not months! Intuitive Study Builder: With NEForm’s Intuitive study building utility, clinical studies and trials are built once and deployed to work online or offline on Windows® PCs, and on Apple® IPad, Android® and Windows® Tablets, Phablets and Smartphones. eSource Data Capture: NEForm built studies utilizing 100% eSource data capture. Investigator site eCRF data and in site and at home ePRO data collected with the same system. A 25% - 30% savings on the cost of clinical trials due to the reduction or elimination of Source Data Verification (SDV) and the elimination of transcription errors. Truly ‘Native’ Apps: The NEForm System is written with 'truly native' applications that collect data offline and empower users to enter clinical data in real-time at point-of-care (POC), at speeds equal to or faster than that of putting pen-to-paper. 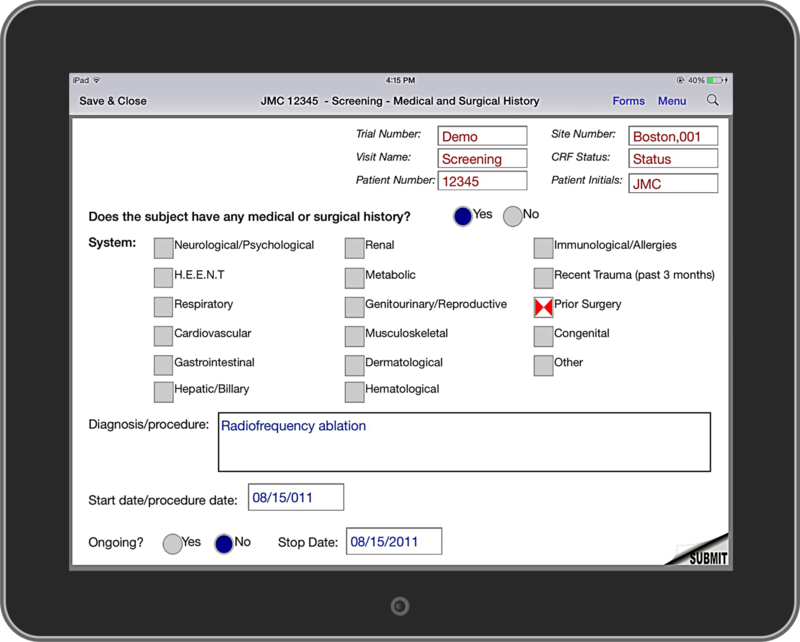 Bring-your-own-device (BYOD): The NEForm system has made it feasible and cost-effective to deploy BYOD eSource Data Capture technology for use by investigators and patients involved in large observational and registry studies, as well as, for those engaged in smaller early-phase and investigator initiated trials (IIT). Multi-Vendor System Functionality: NEForm is so flexible that not only does it collect eSource data for eCRFs and ePRO utilizing BYOD mobile devices, the system also supports Rater Training often used in CNS studies, simple and complex randomization stratified across sites, tracking and reordering of drugs/devices/biologics, electronic imports from local and central labs, ECG and other imports, medical coding, site and vendor milestone-based, payments using QuickBooks®, language translations, product and company branding, exports in over 20 statistics formats including SAS transport files, SPSS etc., standard metric and ad-hoc-reporting, email notifications etc. Simple to Complex Forms: Utilizing NEForm Study Builder, our experienced staff can build eCRFs in days with simple to complex edit checks, branching, logic, hidden fields, embedded pictures and graphics, pull down menu items, etc. BYOD at the Investigator Sites: Sites users may use Apple IPad, Android, Windows Tablets or Windows PCs to enter data as eSource at point-of-care (POC). Page turns and field response time in the <100 msec range. Data entered faster than paper. No internet is required for entry. Data uploads to the server in the background. Audit Trail: A full 21 CFR part 11 audit trail is viewable with the value of the field, the date and time stamp the data was recorded on the local device, who recorded the data and a reason for change if the data changes. In addition, for administrative purposes and metrics, every keystroke on the local device including a date and time stamp for each keystroke is recorded in a separate log file. Queries: Monitors, Data Mangers and even site users may be given permission to write and send queries. A list of standard pre-populated queries is available, while ad-hoc queries may be added. When queries are viewed and answered by the recipient, only the queried field(s) are enable for change. All non-queried fields are set to read-only and disabled. Graphics, Branding and Hyperlinks: eCRFs can be built to display passive or active graphics images, company logos, product names, banners and hyperlinks. Attachments: Scanned documents including labs, informed consents, other data and images may be attached to a question in the eCRFs. Since most tablets and smartphones have cameras, real-time pictures may be taken of wound areas, surgical sites etc., and attached to an eCRF question. Import of External Data: Using data mapping, APIs, HL7 and other import tools electronic data may be imported directly into the NEForm database from external central labs for blood chemistries, PKs, ECGs, ePRO etc. Values may appear as read-only values in fields and fields may be programmed to elicit edit checks. Export of Data: Using APIs, data mapping, HL7 etc., data may be exported to CTMS, Safety and other systems directly from the live NEForm database. Metric Reports: A library of live metric reports are available from NEForm. Ad-hoc Reports: Unlike EDC Systems, because of NEForm’s distributed architecture and offline data collection capabilities, ad-hoc-reports are updated in real-time directly from the ‘live’ database. 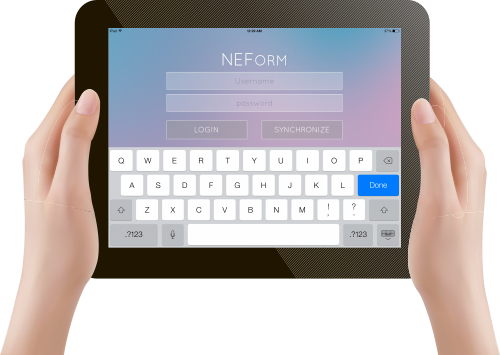 Electronic and Written Signatures: NEForm supports electronic signatures. If a touchscreen-enabled device is used a written signatures may also be recorded with a stylus. Real-time Alerts: Real-time alerts may be set-up and sent via an internal communication system or they may be forwarded to an outside email address. Local Language: Case report form questions, comments, and the entire operating system may per translated into the local language. Workflow: Operationally, workflow is fully configurable in the NEForm system to match a client’s workflow. Simple to Complex Forms: Utilizing NEForm Study Builder, our experienced staff can build ePRO in days with simple to complex edit checks, branching, logic, hidden fields, embedded pictures and graphics, pull down menu items, etc. 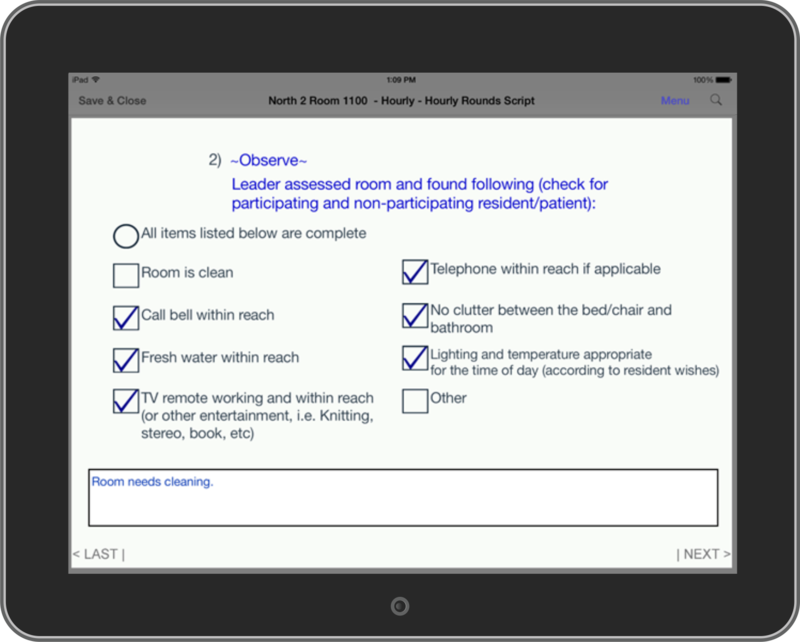 BYOD at the Investigator Sites or at Home: Patients or subjects may use Apple® IPad, Android®, Windows® Tablets or Windows® PCs to enter ePRO data as eSource at an Investigator site, at home or away from home. The page turns and field response time are in the <100 msec. range. Data is entered as fast as or faster than paper. No internet is required for entry. Data uploads to the server in the background. With BYOD, minimum provisioning of devices and minimum training are required, resulting in big savings. Alerts and Reminders: Alerts may be sent to sites to let them know about patient compliance and reminders may be sent directly to patients or subjects. Integrated ePRO and eCRF Data: Data from ePRO, when uploaded populates the same database as the eCRF data. 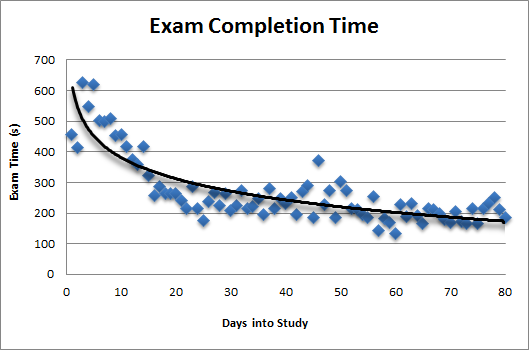 Real-time reports reflect the real-time status of ePRO data. Data may populate, read-only and may be displayed in the eCRFs. Part 11 Compliance: Patients and subjects may download and print a copy of their data at any time. Security: All data uploaded from device to the server database is encrypted and broken up into smaller components which are concatenated together in the database. If a device is lost or if a patient or subject has not responded for several days the device may be disabled remotely. Local Language and Dialects: Case report form questions, comments, and the entire operating system may per translated into the local language and dialect. On a body diagram, patients can mark body parts by circling them or clicking a region. Simple to Complex Forms: Utilizing NEForm Study Builder, our experienced staff can build eCRFs and ePRO forms in days with simple to complex edit checks, branching, logic, hidden fields, embedded pictures and graphics, pull down menu items, etc. 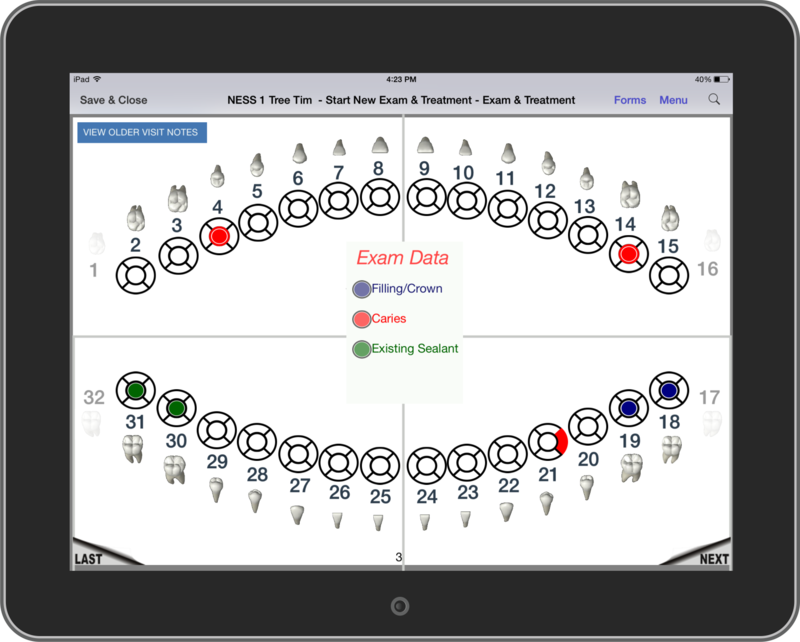 and with the push a few radial buttons the questionnaires and forms may be configured to automatically map, with the same font and form factor, to Apple® IPad, IPhone, and Phablet (including Model 6 plus), Android® Tablets and Smartphones, Windows® Tablets, Smartphones and PCs. BYOD at the Investigator Sites or at Home: Sites users, patients and subjects may use Apple IPad, Android, Windows Tablets or Windows PCs to enter data as eSource at point-of-care (POC). Page turns and field response time in the <100 msec. range. Data entered as fast as or faster than paper. Works Offline and Online: No internet connection is required for data collection. Works where internet is limited or not available. Does not encumber workflow in busy clinic or hospital. Physicians, nurses and site coordinators are free to concentrate on the patient and not on the data entry system. Data uploads to the server in the background. Optimized Workflow: NESS has spent years studying the way site personnel and home users interact with mobile devices and has developed workflows that are intuitive, optimized, and require minimal navigation. Simple to Complex Forms: Utilizing NEForm Study Builder, our experienced staff can build eCRF s and ePRO forms in days with simple to complex edit checks, branching, logic, hidden fields, embedded pictures and graphics, pull down menu items, etc. and with the push a few radial buttons the questionnaires and forms may be configured to automatically map to Windows® PCs. Collect Data Offline as eSource: eCRF and ePRO may be collected offline as eSource without internet connection at point-of-care (POC). Transcription errors are eliminated and the need for source data verification (SDV) is greatly reduced. This results in a 25% – 30% cost savings and allows monitors to concentrate the majority of their onsite time on site and patient compliance and patient safety issues. Viewing Metric and Ad-hoc Reports: Report data may be remotely viewed and monitored online by data managers, project managers, sponsors etc., via the internet using a Windows PC. Enter Data Offline from Paper: When transcribing data from a paper source, NEForm only requires data to be uploaded when committing it to a central server, all univariate, cross form, cross visit edit checks execute locally on the device offline without the need for an internet connection. This makes for a faster data entry for site users when compared to EDC systems. Since the data is entered locally, the sharing of bandwidth by users across many sites does not degrade the system performance. Unlike EDC systems, performance remains stable, unaffected by the scale of the number of patients or users in a study or trial. Supply Management: NEForm module provides automated, integrated clinical supply management and inventory tracking of drugs, medical device components and biologics via Interactive Web Response (IWR). NEForm Supply Management allows users to log in product inventory, define automatic resupply thresholds, track shipments and manage email notifications to single or multiple supplier depots based on location. NEForm Supply Management is intimately integrated with the data collection system, allowing patient enrollment, patient visit schedules, and patient discontinuation to be taken into account providing a just-in-time resupply strategy for clinical supplies. Real-time, dynamic tracking reports allow sites and managers to follow the chain of custody of trial supplies. Site and Vendor Payments: One of the most wasteful, often inaccurate and time consuming administrative activities during a clinical trial or study is the manual process by which sponsors and CROs pay investigator sites and vendors. Late and inaccurate payments to sites and vendors lead to site and vendor frustration and dissatisfaction, time consuming inquiries and reconciliation, strained resources, and clinical staff distraction. NEForm integrated Site and Vendor Payment utility allows sites and vendors to be paid accurately and in a timely manner, based on actual patient procedures performed and other contract milestones taken directly from the clinical case report form data. The NEForm payment utility is easily custom programmed to create an activity log report for the sponsor or CRO. In addition, an electronic file with payments by site and vendor name is loaded from NESS NEForm into Intuit QuickBooks®, which is then used to by sponsors and CROs to cut and issue checks to sites and vendors. NEForm’s automated payment utility will 1) save time and money over a manual payment process, 2) improve site satisfaction and performance, 3) create a system of full transparency and accuracy for sponsors, CROs, sites and vendors, 4) take the bookkeeping burden off of the sites, and 5) eliminate end of trial reconciliations. Medical Coding: Integrated NEForm utility is used by data mangers and medical coders to autocode Adverse Events (AE), Concomitant Meds (CM), and Medical Histories (MH) using any version of standardized coding medical dictionaries including MedDRA®, WHODrug, WHO-DDE, WHO-ART, ICD9CM, COSTART, VetDRA or any other medical dictionary. Verbatim terms that do not autocode may be manually coded and updated in a synonym table which allows autocoding system to learn and autocode at a higher rate on subsequent coding passes. Reports: Unlike EDC systems, NEForm produces in real-time, both clinical trial and study metric reports and ad-hoc-reports which are dynamic, extracted directly from the ‘live’ database. . Changes to the data, just before trial or study freeze or lock, will be reflected accurately and immediately in the reports. Easy to use ad-hoc-reporting utility allows those with secure access to filter data by multiple attributes (site, age, race, treatment, etc.) from multiple database table domains. The utility quickly performs logical table joins in the background off of the ‘live’ database and makes the data available for easy viewing in a table format and printing and exporting to MS® Excel for further manipulation and graphing. For users that are not familiar with the study or trial database variable names, there is a quick link feature back to the actual case report form where the variable can be seen directly in the question and within the context of the eCRF. Rater Training: One of the unique modules available in NEForm, used quite often to gather data from patient interviews for CNS trials is NEForm Rater Training. NEForm Rater Training allows a rater to interview a patient and based on the patients responses record both discrete validated questionnaire response data (HAM- D etc.) and record comments and notes either with the touchscreen keypad or a stylus on an Apple® IPad, Android® or Windows® Tablet. There is an option, with patient consent, to record the sound or the sound and the video for an entire rater interview session. The NEForm Rater Training module is an eSource data capture system which works offline, as fast as or faster than paper. When the patient interview is complete and when a wireless network is found, NEForm can be programmed to automatically upload the data to NESS servers, or to prompt the user to upload and synchronize the data file at the end of their final patient interview session or when the rater logs into the NEForm Rater Training module to begin a new session. Rater sessions may be presented in any language. Global capture of rater interviews makes it easy for sponsors and CROs to remote monitor rater and patient activity. Similar to all NEForm modules and utilities, CNS trial data from the NEForm Rater Training module is integrated directly into the same database as the corresponding eCRF data and ePRO data for the trial. With the NEForm integrated system it is easy to program cross module edits, and obtain reports and exports of data for a patient or groups of patients gathered across all modules. Randomize Trials Across Sites: Optional NEForm module provides automated, integrated, randomization within the same database as the data capture. Read and implement 1) simple, 2) block, 3) stratified and 4) unequal randomization schedules. Stratify and randomize patients across sites by treatment, gender, age, race, disease severity, lab value etc. Send notification to a pharmacist or medical monitor while keeping other system users blinded. Highly Optimized: NEForm allows our experienced team to build questionnaires and data gathering systems to be used by medical personnel in hospitals. Physician’s offices, nursing homes, kidney dialysis centers and other healthcare facilities to provide immediate feedback for improving patient outcomes. Intuitive Study Builder: With NEForm’s Intuitive study building utility, questionnaires are built once and deployed to work online or offline on Windows® PCs, and on Apple® IPad, Android® and Windows® Tablets, Phablets and Smartphones. Truly ‘Native’ Apps: The internet in hospitals and other healthcare facilities is often restricted. NEForm is written with 'truly native' applications that collect data offline and empower users to enter employee, physician and patient healthcare observational data in real-time at speeds as fast or faster than that of putting pen-to-paper. Bring-your-own-device (BYOD): The NEForm system has made it feasible and cost-effective to deploy BYOD eSource Data Capture technology for use by coaches, rounding personnel and anyone involved in recording observational data for purposes of affecting positive patient and operational outcomes in patient healthcare. 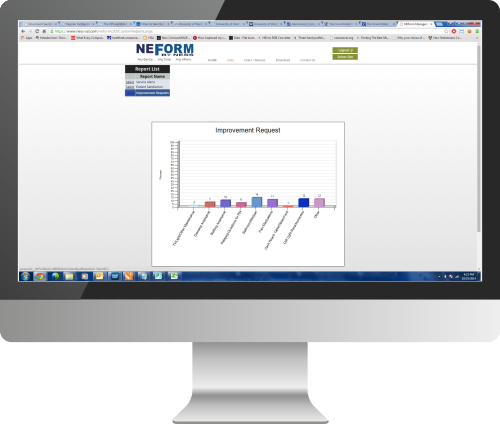 Aid for all CAHPS Surveys and Assessments: NEForm Medical can be configured as an aid to support and bring about positive change in any area where patient healthcare outcomes are a measured including but not limited to: H-CAHPS, CG-CAHPS, ED-CAHPS, HH_CAHPS, FFS-CAHPS, MA & PDP-CAHPS, ICH-CAHPS, Hospice CAHPS, O/ASPEC Surveys, Physician and Medical personnel shadowing, and healthcare employee assessments. Hospital Rounding: Hospital (H)-CAHPS surveys are patient satisfaction surveys occurring post-discharge, give no opportunity for healthcare providers to address service failures with contemporaneous corrective action. Prospective surveys taken with NEForm HIPAA compliant, bedside Rounding System are a more effective way to allow the surfacing and response to problems prior to patient discharge resulting in 1) better patient outcomes 2) a reduction in call button usage, 3) a reduced burden on nursing staff and 4) an increase in post-discharge H-CAHPS scores.